Weiman’s Instrument Care T-5 removes rust, stains and mineral deposits from stainless steel instruments and helps restore original luster to metal. 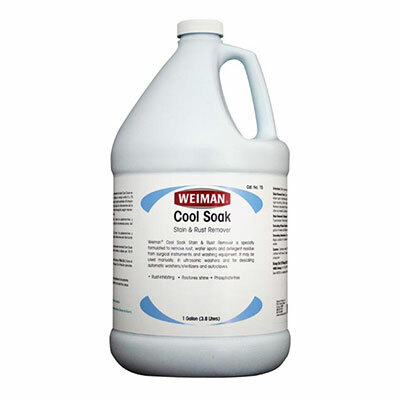 Cool Soak can also be used to clean and descale autoclaves. Stain-Away Wipes are convenient, ready to use wipes for removing stains from stainless steel instruments. Adhesive Remover eliminates adhesive residue from surfaces and skin.